This handsome and modern 11-story building houses the Dance Theater Workshop on its lower three floors and its top floors have 12 condominium apartments ranging in size from 2,158 to 2,675 square feet. Designed by Ed Rawlings, the building's apartments have have column-free, unpartitioned spaces that permit flexible layouts of two to four bedrooms and up to three bathrooms. They are distinguished by a 53-foot-long wall of windows that opens onto private balconies. Each apartment has an island kitchen by Builthaup with Subzero, Thermador, Gaggenau and Bosch appliances and a windowed master bathroom with marble finishes. The eighth floor apartment has north and south roof terraces of 2,041 square feet and the building's penthouse has a 53-foot-long southern balcony and a 1,226-square-foot south racing roof terrace above. The apartments have insulated double walls and floors, wide-strip maple hardwood floors, and high-speed data connectivity. There is a residents' rooftop recreational area and the mid-block building's lobby is finished in stone with stainless steel features and a video security system. 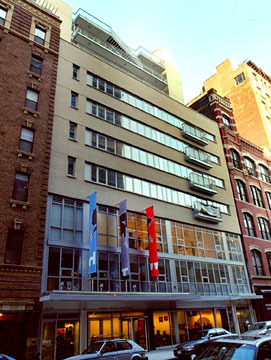 The building is very close to the Joyce Theater on Eighth Avenue, one of the city's premier venues of modern dance, and this area is one of the city's liveliest with many restaurants and art galleries. The Dance Theater Workshop was started in 1967 by Jeff Duncan, Jack Moore and Art Bauman in a loft and in 1975 they moved to the American Theater Lab at this location and in addition to present almost-weekly dance concerts it commissioned dance works and in 1984 it began producing The Bessies, New York Dance and Performance Awards. It bought the building in 1995 and closed it in 2000 to demolish it and construct a new mixed-use facility. "Speaking of transformations, if you haven't been over to the new Dance Theater Workshop building yet, bring sunglasses; it's dazzling. The endearing squalor is gone, but with it went the entrance 'lobby' in a stairwell, the bleacher seating, the cramped backstage areas, the hideous bathrooms. Now civilization reigns in a glass-front lobby with café, and state-of-the-art performance facilities. A family-friendly management has even introduced 7 p.m. curtain times." The Dance Theater Workshop is one of Chelsea's most important cultural institutions and its new building is a significant modern addition to the neighborhood.